The 2018 Hobie 16 North American Championships came to and end this past weekend at Navarre Beach in Florida. 67 teams from from across North America competed in the five day event which held mainly light wind conditions. 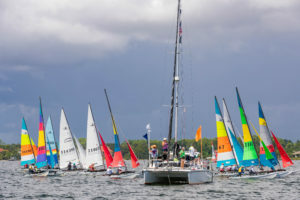 The layout of the sailing area caused the race officers to run a split fleet format with teams seeded in four flights and competing in two starts per race. 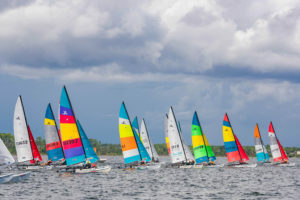 This format was run for the first three days of racing and then the fleet was split into gold and silver for the final two days of the championships. Taking first place was Enrique Figueroa and Melisa Gann of Puerto Rico. Figueroa and Gann dominated the event, winning with a total of 48 points and finishing almost 30 points ahead of second place boats at 77 points. A four way tie ensued for second place. The tiebreaker resulted with Mark Modderman and Alexander Liu of the USA in second, and Pat Porter and Heather Matthews of the USA in third place. Racing got underway with light winds from 5-7 knots after a morning postponement. The wind didn’t hold for long and two races were scored. Day 1 was commanded by Ken Hilk and Darcy Jensen of Gulfport Yacht Club with first place finishes in both races. Another delay in the morning gave way to 5-10 knots of breeze that eased as the day unfolded. The conditions on the race course proved challenging with many shifts and changes in velocity that provided many passing opportunities. The fleet was quite compact due to the wind direction in the tight sailing venue, making clean air and open lanes tough to find. Enrique Figueroa and Melisa Gann of Puerto Rico took the lead after the days three races. The third day of racing saw light linds from 4-7 knots with a persistent shift to the right. Like the day before, trying winds tested the sailors on the racecourse and picking the lanes and shifts to tack on were critical. The fourth day of racing was the first day the teams were split into gold and silver fleets. Conditions were similar to the first three days with light winds from 4-8 knots. Some aggressive starting in the gold fleet resulted in some general recalls and later the U and black flags by the race committee. After the days three races, team Figueroa/Gann of PUR extended their lead in the championships. After a on-shore delay the final day of racing finally held medium winds which enabled teams to at least single trapeze. The 8-10 knots of breeze were welcomed by the fleet after four days of light winds. Continuing upon their previous days of consistent sailing, Enrique Figueroa and Melisa Gann finished strong and took the top place followed by Mark Modderman and Alexander Liu in second, and third place was Pat Porter and Heather Matthews. Class organizers were pleased with the Florida event and the large turnout of teams. 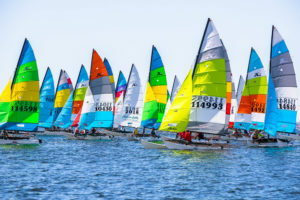 The event was the qualifier for the 2019 Hobie 16 World Championships from November 1st-16th hosted on Captiva Island in Florida. Next years 2019 Hobie North American Championships will be held in Harrison Hot Springs, British Columbia in September.